In recent weeks, several mass shootings have grieved the heart and captured the consciousness of the nation. In Charleston, NC, a devastated community responded with forgiveness and compassion in the wake of a heartless attack by a white supremacist in the historic Emanuel AME Church. In Chattanooga, TN, a Muslim jihadist targeted and killed five members of the military. In Lafayette, LA, a madman sought to emulate the Aurora, CO, movie theatre massacre. How are these tragedies alike and how do they differ? The answers may surprise you. An extremely rare and isolated act of terrorism by a white supremacist made national news because it was so rare and so tragic. The family and local community gave an epic Christian response: forgiveness. Despite the fact that white supremacy is virtually non-existent, many on the Left exploited this tragedy to convict all whites (especially conservatives) of racism. The Left has done this for several decades, redefining terrorism as exclusively conservative in nature. Christians have even been accused of being terrorists. Chattanooga, TN, is now the site of a classic case of ISIS-inspired Islamic terrorism in America’s homeland, this time targeting the American military. With ample information to classify this tragedy as a terrorist attack by an Islamist, the Obama administration and left-wing media remained in denial, blaming everything but the terrorist’s radicalization as an Islamist as the motivation for this attack. While the media is eager to taint evangelical Christians and conservatives with the terrorist label, they are loathe to identify actual Islamic terrorism as terrorism committed by Islamists. But for the intervention of a security guard, it is likely that many people would have died at the hands of Islamic jihadists who sought to strike terror in the midst of a Draw Mohammad Contest in Garland, TX. In Lafayette, LA, a man with a long history of mental illness sought the death of innocents in a movie theater. Strikingly, some in the media immediately leapt to the conclusion that the shooter was a Tea Party member motivated by conservative, anti-government ideology, despite distinct parallels with shootings in Aurora, CO, and elsewhere – shootings committed by individuals who were mentally unstable. Instead of addressing the shooter’s mental illness and previous outbursts of violence (and seeking ways to prevent their escalation to mass violence), the Left, again, targeted guns. All three attacks were acts of evil. Only two were acts of terrorism. The first was an extremely rare instance of white supremacy, while the second falls into a pattern of Islamic jihad which is all too prevalent overseas and increasing here in our nation’s homeland. In both instances, the terrorists committed terrorism to pursue an ideological agenda. Madness (not ideology) was at the heart of the third attack. All three killers obtained guns legally (though at least one lied on his form and another apparently procured a weapon through Obama’s Fast and Furious program). Practical solutions to minimize these sorts of mass shootings include the proper enforcement of existing laws, adequately addressing mental health issues and ensuring those issues are linked to background checks, detecting those who are radicalized to Islamist ideology, and countering Islamic ideology with the truth. Not to be neglected, we should all beseech our Father in heaven who was worshiped by those believers in Charleston – the source of their forgiveness – to protect us and bring sanity back to our nation. Let us be a people responsive to God’s will as He searches our hearts. Update: Nashville, TN. An off-duty police officer prevented a deranged man from committing what at first appeared to be attempted mass murder in yet another mall movie theater – in a gun-free zone – on August 5, 2015. Update: Roanoke, VA. Vester Lee Flanagan II (aka Bryce Williams) executed two former colleagues and issued a political manifesto – an act of terrorism by a madman – on August 26, 2015. Update: Roseburg, OR. Chris Harper Mercer conducted a massacre at the Umpqua Community College (UCC) campus, following in the footsteps of Flanagan. Multiple reports show that he deliberately targeted Christians. We will hear little about this assault against Christians by a mentally disturbed, half-black immigrant – a profile which does not fit the preferred media narrative. See “King’s Dream Realized (sort of)” at http://wp.me/p4scHf-76. See “Our Daddy: God is Our Refuge” at http://wp.me/p4scHf-aE. See “Terrorism Redefined” at http://wp.me/p4scHf-S.
 See “Left Politicizes Las Vegas Shootings” at http://t.co/dPKxyOnxsH. See “CPAC: Alleged Christian Terrorists” at http://wp.me/p4scHf-8I. More accurately, critics claim that these terrorists are Christians committing terrorist acts in the name of Christ. See “’Right-Wing Terrorists’ or Muslim Jihadists” at http://t.co/JriDYcKizd. See “OK Beheading? Must be Tea Party Christians!” at http://t.co/JeE8yIckeC. See “Right-Wing Islamic Terrorists” at http://wp.me/p4scHf-6V. See “Islamists Fear Cartoons” at http://wp.me/p4scHf-9Z. “This means [John Russell] Houser joins Muhammad Youssef Abdulazeez (Chattanooga), Dylann Roof (Charleston), Elton Simpson and Nadir Soofi (Garland), Jared and Amanda Miller (Las Vegas), Elliot Rodger (Santa Barabara), Ivan Lopez (Fort Hood 2014), Darion Marcus Aguilar (Maryland mall), Karl Halverson Pierson (Arapahoe High School), Paul Ciancia (LAX), Andrew John Engeldinger (Minneapolis), Aaron Alexis (DC Navy Yard), Tennis Melvin Maynard (West Virginia), Wade Michael Page (Sikh Temple), James Holmes (Aurora theater), Jared Loughner (Tucson), Nidal Hasan (Fort Hood 2009), Jiverly Wong (Binghamton), Seung-Hui Cho (Virginia Tech), Naveed Haq (Seattle), and Mark Barton (Atlanta) on the list of attackers and alleged attackers who acquired their guns via background checks.” – see http://www.breitbart.com/big-government/2015/07/24/atf-john-russell-houser-purchased-his-pistol-legally/. 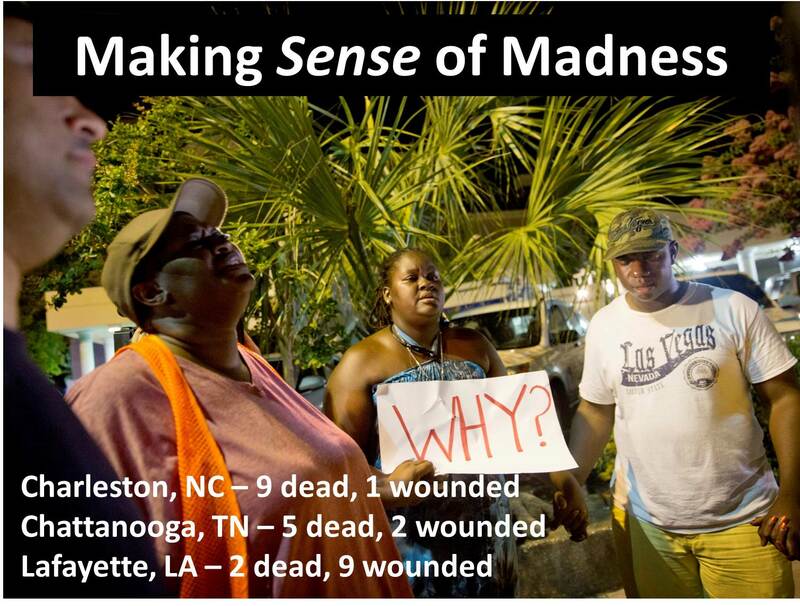 See “Let’s Stop the Insanity Over Gun Violence” at http://wp.me/p4scHf-1o. Col. Oliver North, On the Record, FNC, 7/31/15. This entry was posted in Uncategorized and tagged Charleston NC, Chattanooga TN, Clementa Pinckney, Dylann Roof, Emanuel AME Church, forgiveness, God’s glory, gospel of love, gun control, ISIS, Islamic jihad, Jesus Christ, John Russell Houser, Lafayette LA, Muhammad Youssef Abdulazeez, Nashville TN, Norvel Goff, Paradise, terrorism, Vincente David Montano, white supremacists on August 4, 2015 by BrotherWatch. Thank you! This was excellent. Easy to understand with end notes even!!! Thank you again.